We had a stall at the Martinborough Fair yesterday. It’s great fun meeting lots of new people, as well as old friends. Ed was one of my helpers (along with his girlfriend – they did an awesome job) and it was such fun to run into Debbie, one of the women who worked at the daycare centre Ed attended for nearly four years as a pre-schooler. The last time we saw Deb was at Ed’s 5th birthday party. We are now planning Ed’s 21st. Deb is the same height as she was 16 years ago. 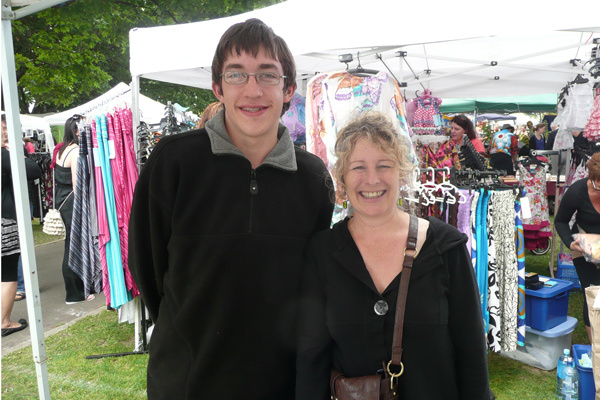 This entry was posted in Life and tagged Ed, Martinborough Fair, old friends by Margot. Bookmark the permalink.